We are respected for safe, quality installation of metal deck solutions on specialist and large-scale buildings. We are approved metal decking contractors for Tata Steel and experts in ComFlor® and RoofDek applications. We work with integrity and honesty, honouring our family values since 1992. 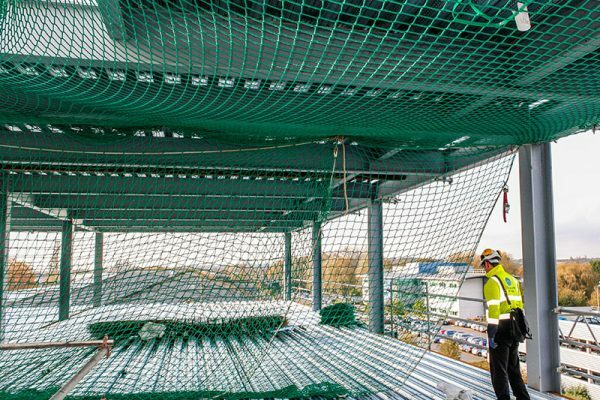 With safety at the vanguard of our work; we detail, supply and install composite metal floor and structural roof decking for multi-storey construction in all sectors including Education, Business, Residential, Transport and Retail. From small to large, supply only to full project management, our job is to assist you to deliver yours. To see our full service offering, scroll down or download our brochure. We create inspirational spaces for society. Working with us, you’ll notice our difference. Our full metal decking service from guidance to completion. Early engagement enables us to deliver the most cost-effective solution for you. Are you an Architect, Engineer or Design Manager? We help engineer value into the decking design and advise on the best product choice to meet the project’s objectives whether that be cost, strength, acoustic, light-reflective or environmental rating. Working together at this early stage, we can plan and overcome any potential issues. Honest pricing with no hidden extra costs, simply delivering quality on time. Are you an Engineer, Steel Fabricator or Main Contractor requiring a steel deck sub-contractor? We provide sequencing and programme advice to ensure your project is fulfilled regardless of complexity or cost constraints. In our pre-contract meetings, we use technical expertise to fine tune the quotation to give you the best possible cost advantage. If you’re a builder, we also offer ‘Supply-only’ quotes – contact us. Using our tech skills and expertise, we interpret the GAs into construction issue deck drawings. Are you the Main Contractor, Steel Fabricator or Engineer working with us as a steel deck sub-contractor? From an ideal 8 week lead time to quick turnaround, we are flexible and can accommodate complex requirements. Contact CAD Procurement Team. Planning and managing your projects safely and effectively. Are you a Principle Contractor or Steel Fabricator working with us on a project? Flexible to react, quick to install and professional handover. With the use of Slack real-time communication software, our Project Managers and Installation Teams work flexibly and can install at a rate of >200m² a day on regular structures. Contact Project Management Team. Providing a Full Metal Decking Service from Guidance to Completion. Are you an existing client starting a new project or new to the benefits of metal decking? As your project nears completion, we will work with you to engineer the best value into your next project. If you’re new to the benefits of metal decking over traditional concrete builds, we can advise and help plan your project. We don’t just deliver projects for our clients, we build relationships. Let’s start the journey together. Providing you technical solutions and expertise. Whether it’s aesthetics, strength, efficiency or spanning capability you require, we will guide you towards a comprehensive structural roof decking solution. From schools to car parks, retail to warehouses, hotels to business districts, we are repeatedly trusted by clients to install to the exacting expectations of each project. By consulting with us prior to steel work fabrication, we can often improve the effectiveness of the frame and deck design to reduce the overall cost for you. Reduce the risks associated with voids in the deck and provide access routes for future trades, through our hassle-free site safety system. Working together to build excellence. Benefit from four decades of metal decking product expertise. Our teams are professional, approachable and highly knowledgeable in the supply and skilled installation of composite metal floor and structural roof decking. Everyone working together towards a shared goal is key to our success. If you’re a regional contractor, builder or working on a self-build project, we offer a hassle-free supply only service. Working with clients is our purpose. Building trust is what makes us different. A huge thank you for giving your time and skills to get the Grenfell charitable builds built. It’s genuinely been a pleasure to work with you and I hope you are all proud of what you’ve achieved. We hope you are proud of creating this legacy for the Grenfell community and enjoy the programmes. Just wanted to let you know that Gary & Ryan, the guys laying our decking, were super stars. Very much appreciated their hard work and for being ultra-nice people in general & to work with too – thank you. Please give them a pat on the back! The Composite Profiles team beat the programme for the crane infill work. Our appreciation for your organisation and efforts. Senior leaders are very visible in the organisation of the office teams and the site teams. They are instrumental in setting the standard for the way things are done.